August 1, 1885. The Jury in the trial of Louis Riel has found the defendant guilty of the capital crime of HIGH TREASON. Your reporter at the Voice of the People has followed the trial closely and has found clear evidence of governmental interference in regard to the charge, the jurisdiction of the court and in providing appropriate evidence requested by the defendant. As well collusion and familial ties have surfaced between the council for the defence and the prosecution. They have serious conflicts of interest that should bar them from the court. The “guilty” conviction was, by law, a drawn conclusion based on a one-sided presentation to the jury. With no attempt by Riel’s counsel to seek the true merits and motives of the defendant he was doomed if convicted or not. Based on the evidence provided the jury asked for the “mercy of the Crown” to no avail. Judge Richardson, also legal council to the Territorial Lieutenant Governor, ignored the jury’s recommendation for mercy and sentenced Riel to “hang by the neck until dead.” Given the structure of this trial this outcome was a fore-drawn conclusion – which we shall prove as our coverage of the trial of Louis Riel continues. 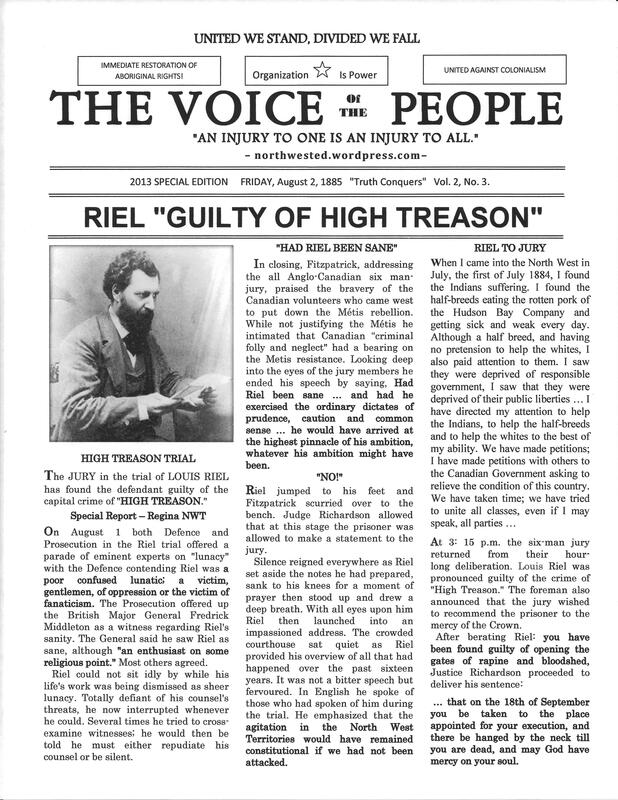 The Voice of the People will continue to follow and investigate the greatest tragedy in Canadian justice – the trial and execution of Louis Riel. Voice of the People, Vol. 2, No. 4.